There are many who keep wondering from where did music originate? Here are few articles for those who believe in mythology.. The general belief among Indians is that music is divine and life like. Even Gods are pleased by music. Even today, it is common to recite mantras and other hymns in praise of Gods during Hindu religious ceremonies. Often, these mantras and hymns are recited musically because they are very pleasing to those who are present in the congregation. Also, many of our culture’s stories describe some of the Gods and saints as gifted musicians, excellent dancers and learned scholars. For example, Krishna is a flute maestro. Goddess Saraswathi is a Veena player, while Nandi is an accomplished drummer. Shiva and his wife, Parvathi are great dancers. Brahma and Saraswathi are learned, wise scholars. In fact, Saraswathi is also personified as the goddess of wisdom, learning and knowledge. The Gods and saints are not described as musicians or scholars simply to make them appear interesting, however. Through the narrations of reading about the life of these accomplished individuals, we discover the qualities that made them great but also the weaknesses that made them fail. For example, take the story of Saint Narada. Narada, when translated into English, means knowledge giver — Nara is the word for knowledge and Da means giver. Saint Narada is most known for creating mischief and quarrels between people (although the quarrels always lead to good things and makes everyone happy). Apart from his mischief making, however, Narada is also well known for his supreme musical talents – according to Hindu mythology, he introduced people to the gift of music. Narada always appears with a Veena in his hands and constantly chants the name of Lord Narayana. Even today, In India, when a religious discourse or a Yakshagana (a type of dance-drama or an opera) is held, the programs begin after invoking the name of Narada. Saint Narada, wasn’t without flaws, however. He was proud of his musical skills, but looked down on others who were less skilled than he was. Once he went to the kingdom of Lord Krishna. Krishna knew of Narada’s arrogance and wanted to teach him a lesson on modesty and respect for others. Krishna asked Narada to play his Veena before an assembled audience in his court. Narada played the Veena brilliantly and delighted the audience with his music. At the end of his performance, Narada turned to Krishna and waited for the God to express his appreciation of Narada’s music. Krishna, instead, turned to Hanuman, the monkey God, who was sitting in the audience, and asked him what he thought of Narada’s music. Narada, unaware of Hanuman’s divine status, was very unhappy that Krishna, instead of expressing his appreciation, sought the opinion of a mere monkey. “What does a monkey know about music?” Narada thought. Krishna reading the mind of Narada said, “Oh Narada, I understand your concern, but first, let us find out if this monkey really knows anything about music. Give him your Veena and let him play it.” Narada became even angrier because musicians consider their musical instruments sacred. Narada didn’t want to share his Veena with anyone, especially not a monkey. He couldn’t refuse Krishna’s request however, and reluctantly handed the Veena to Hanuman. Hanuman began to play the Veena and sang beautiful hymns in praise of Lord Rama. The Monkey God’s singing and playing was so sincere and so devoted that the entire audience was mesmerized. Even the great musical genius Narada was compelled to appreciate Hanuman’s music. Being a person of enormous wisdom, Narada began to realize the lesson that Krishna was teaching him. Narada asked Krishna’s forgiveness for not respecting the greatness of Hanuman and for underestimating Hanuman because he was a monkey. Like the story of Narada, the myth of Ravana also illustrates the importance of good conduct and morality over mere accomplishments in music or education. Ravana, the mighty demon king of Lanka is one of the principal characters from the Ramayana. Like Narada, Ravana was very talented in music and also very learned and knowledgeable in the Vedas and the scriptures. He was an ardent devotee of Lord Shiva and enchanted Shiva with his music (Shiva is called “Gana Priya”, one who is pleased by music). One day, delighted by the demon king’s music, Lord Shiva granted him a wish: Ravana desired that his life could only be ended by Shiva and by no other Gods. As the years passed, Ravana acquired enormous powers through his penance and through the wish granted by Shiva. But, instead of using his powers and his knowledge of music and the Vedas to benefit the world, Ravana used them to only benefit himself. He became very proud, conceited, and even immoral. According to the Ramayana, Ravana kidnapped Sita, Rama’s wife and tried to take her for his own. To rescue his wife from Ravana, Rama, invaded Lanka. But Ravana was unconcerned, confident that he was too powerful to be killed by Rama. Alas, he didn’t realize that Shiva only exempted him from being killed by Gods, but not human beings. Since Rama was a human incarnation of Vishnu, Shiva’s boon could not save Ravana. He died at Rama’s hands. We can learn a great deal from the stories of Narada and Ravana. The Narada story shows that even great saints and learned scholars occasionally make mistakes or act foolish. Regardless of one’s accomplishments in music, art, or education, one must be modest and simple and never underestimate the talents of others. More importantly, we must learn, like Narada, that no one, not even great Saints, can judge people based on their color, appearance, or origin. Finally, even great saints can admit when they are wrong. Ravana’s story tells us that having musical talents or knowledge of scriptures isn’t adequate. We must also live a life of austerity and simplicity. We must not always pursue our own interests, but must also work toward the welfare of the community and world in which we live. Like Ravana, we must learn that a person does not become powerful because of birth, wealth, or possessions. Even the most powerful will become powerless if they violate ethics and morals. Hindu mythology is intended to help us see ourselves more clearly by depicting the lives of Gods and Saints in everyday situations. By reading their stories, we can learn from the mistakes made by these characters as well as the lessons that they learn from them. In this way, we can use these stories as a way to examine our own lives and see how we can make our world and ourselves better. Although it was decided to give the celestial art of sangeet to mankind, a suitable human had to be found who was capable of receiving this gift. Sangeet had always been in the realm of the demigods (gandharva. A super-human of superior spiritual ability was required to convey this celestial artform to the world of man. It fell upon the great sage Narada to be the first mortal recipient of this divine art. Through Narada, we are indebted for the presence of classical music. The introduction of this artform to the mortal world was only the first step. Traditional pedagogy had to accommodate it. Classical music is considered more than mere entertainment; it is a moral and spiritual redeemer. Therefore, the divine qualities inherent in the artform imply certain prerequisites; key among them are guru, vinaya and sadhana (Shankar 1968). This translates to teacher, humility, and discipline. The guru, or teacher is the most important prerequisite in traditional musical pedagogy. Music is said to be a guru mukha-vidhya (i.e., knowledge which must come from a teacher). This is considered the highest form of knowledge. Traditional pedagogy is based upon the transfer of knowledge from the teacher (guru) to the disciple (shishya in an unbroken tradition (parampara) (Courtney 1980). The tradition of guru-shishya-parampara extends back countless millennia. The second prerequisite is vinaya (humility). This also reflects the divine origins of the artform. Classical music is said to be a worship that involves both the listener and the artist alike. Any negative emotions such as arrogance (abhiman) becomes an impediment. This is an impediment from both the divine aspect as well as a matter of simple pedagogy (e.g., “If you think you already know everything, then what is there to learn?”) The final prerequisite for a student of classical music is sadhana (discipline and practice). Sadhana is necessary at two levels. At one level, the divine origins of the artform require that the student “be prepared” to be a recipient of this knowledge. However, from a simple pedagogic standpoint, the music is so incredibly difficult that if the student does not devote countless hours of practice spread over many years, the student certainly will not be able to master the music. This may clarify many points of pedagogy, but what about the artform itself? Any art must deal with the topic of aesthetics. The Indian tradition has much to say on this point as well. The ancient scriptures describe nine fundamental emotions from which all complex emotions may be produced. Just as all hues may be produced by mixing the three primary colours, so too, all emotions are said to be derived from these principal emotions (Shankar 1968). They are called navaras and are shown in the table below. These emotions form the aesthetic foundation for sangeet. We must remember that we are talking about music. This requires an acoustic vehicle to convey these emotions. This acoustic vehicle is known as rag. Rag may be thought of as the melodic foundation upon which classical Indian music is based. During the last few centuries it was customary to anthropomorphize the rag in the form of gandharvas (demigods) and apsaras (celestial nymphs). The divine quality of music is perhaps best illustrated in nad siddha. This is the ability to perform miracles by singing or playing certain rags. The most famous miracle-working musician was Tansen (Garg 1984). It is often said that he was able to create fire by singing rag Dipak, or create rain by singing rag Megh Malhar. We have seen how this artform is considered divine. This divine quality influences concepts such as aesthetics and pedagogy. The reverence that Indians have for this system may only be seen in a traditional approach. However this does not bar us from taking a more objective approach. Music is an integral part of Hindu Mythology. According to Hindu Mythology, music originated with the first sound in the universe, OM, also called Naada Brahma (the first note). OM is believed to be the purest sound ever made, and just chanting of OM can heal the body. OM is positioned in Indian philosophical and religious thought as being one with the rhythms of the universe. The correct rendition of it requires a particular breath-process, and as such is believed to clear the system and the karmic cycle. There are several music CDs made around this theme of chanting OM. Preface to one such CD says – OM is a musical bliss through the regular use of which, a restive heart and stressful mind can achieve eternal peace and harmony, delirious joy and happiness of being at one with the Creator. Music in the celestial world was practised by Gandharvas, demigods. Indra and other gods requested the Creator, Brahma, to give the people something which not only creates a diversion from their bad ways, but helps in their upliftment. Brahma agreed and gave music to people through a human with extraordinary abilities, Narada Muni (sage). Even now, Narada is represented with images of him carrying a Tanpura. 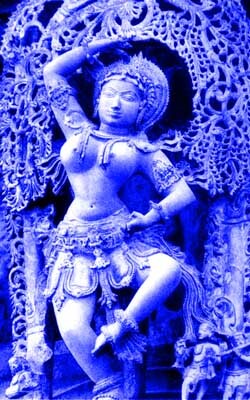 Brahma is also said to be the author of the four Vedas, of which the SamaVeda was chanted in definite musical patterns. Other vedic hymns were sung in plain melody, using only 3 notes. Many mythological figures have music association. Sarasvathi, the goddess of learning and knowledge, is represented as playing the ancient instrument, Veena. Infact, the most common form of veena is called Sarasvathi Veena. Ravana, the villain of the epic Ramayana, was proficient in Veena. Considering these beliefs it is not surprising that even to this day, music and musical instruments are considered sacred. All classical composers are considered saints and are worshipped (especially the Carnatic composers like Sri Purandara and Shri Thyagaraja) as such. The ragas marked with asterix (*) sign mentioned above are listed in Guru Granth Sahib’s ragamala, which has a mention of a total of 64 raga names, including 6 major ragas, 30 raginis and 48 sons of ragas. Thus out of a total of 64 ragas mentioned in the ragamala, the Sikh Gurus have used only 20 (17 major names, and 3 other raga names) ragas and have used 17 (14 major names and 3 other names) other ragas which are not mentioned in the Guru Granth Sahib’s ragamala. 1. Soohi – Being away from home. The soul being away from the House of Lord and the joy of meeting the true husband. From ancient times, music has been regarded as a sacred art. It is related to certain values which are sublime and permanent but intangible. In the Vedic age, religious songs were sung in India in simple chants. Later on, Gandharva music “was seen by the Creator in His contemplation and afterwards performed by seers and saints”, and was considered as the surest means of attaining liberation. Sacred music was known as Marga Sangeet, while secular music was called Desi Sangeet. And I look to Thy face and tears come to my eyes. Though music is generally tabooed in Islam  as an instrument of satan, it enjoys a place of pride among the unorthodox Sufi mystics. They call it Samai Hakani–spiritual trance. The Chisti mystics of northern India encouraged the qawwals (musicians) to sing the praises of God and then got into a situation of rapture when all danced together in a sort of mystic trance. 1) Sunan : Hearing to the Holy Word. 2) Kirtan : Singing of the praises of God. 3) Simaran : Remembrance of the Lord. 4) Pooja : Love-worship of the deity or God. 5) Pad-sevan : Surrender of the self at the Lord’s feet. 6) Vandhana : Supplication to the Lord. 7) Dasa-bhava : Considering oneself as the Lord’s servant and obeying His commands. 8) Maitri Bhava : Real friendship with the Lord and total dependence on Him. 9) Atam-nivedan : Surrendering oneself to the Lord as an act of total dedication. This leads to the merger of the individual soul with the Universal Soul. “Gurbani is the treasure of the jewels of Bhakti. I cherished up to you will receive carried out right here. The caricature is tasteful, your authored material stylish. nonetheless, you command get got an shakiness over that you would like be turning in the following. sick surely come further formerly again since exactly the similar nearly a lot regularly within case you shield this increase. needs and additionally make sure your computer can handle the pressure. And if you’re using the proper beat making program, then that’s less unrealistic as the idea sounds. Expensive Robbie, start off by not becoming self-conscious. though so, if you want to, take some style classes from Italian fellas, properly place collectively even if informal. man comfy with himself. Excellent luck and do let me know. Exactly where are you shifting to in any case?